Did you make the collage of the pics, Love? It's beautiful. It mentions Heath being number three on the list with his contract for Dark Knight that includes a percentage of the box office and merchandising sales. Ledger died in a New York apartment in January aged 28. Theatre. Mr Ledger said he was honoured and intensely proud. But Mr Barnett says the local arts community is divided over the decision. He says the Government is now considering alternatives. father today, who is distressed by the Government's decision. name was up for review. distress over the loss of Heath," he added. someway, it just won't necessarily be named after him. Mr Wyatt says name should be left to stand. those nominated for the international AFI award. Two of Heath Ledger's close friends have revealed how the late Australian actor yearned for friendships with ordinary people as his celebrity status soared. 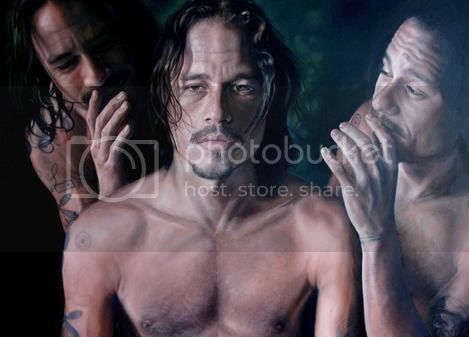 Jud Mongell, Ledger's business partner in the New York eatery Five Leaves, and tattoo artist Scott Campbell became firm friends with the actor after Ledger's Oscar-nominated performance in Brokeback Mountain. Campbell had done seven tattoos for Ledger. "We would all hang out in the West Village, and he was just like the guy with a cigarette," Campbell told the New York Times. "He loved when anyone would react to him as a normal person. He really appreciated that." Ledger would give out his cigarettes and strike up a conversation with just about anyone, he said. But the minute anyone said, 'You're Heath Ledger', the conversation would become stilted, Campbell said. Ledger, 28, died on January 22 from an accidental overdose of a cocktail of medications. He was found dead in his Soho apartment by a masseuse. The actor had just completed his last film, The Dark Knight. In 2005 Ledger and Mongell met at a beach party in Australia and as their friendship developed, they planned an Australia-meets-America cafe bar. The nautical-themed eaterie, specialising in oysters, opened on September 17, in the Williamsburg district of Brooklyn where Ledger had spent some time. The area is known for its arts community and ethnic flavours. "After a while, Heath had all his regular spots around here, and no one would call Page Six (the gossip page of the tabloid New York Post) anymore when he walked in the door, because nobody cared," Campbell told the paper. "This (the cafe bar) would have been Heath's hangout," Mongell told the Times. Mongell runs Five Leaves with his wife. He still refers to Ledger as an equal partner in the business and says Ledger's father, Kim, manages the business finances. Mongell said the actor took New York to his heart. "He taught his daughter how to skateboard. He rode his bike over the Williamsburg Bridge. He visited farmers markets. He played chess in Washington Square Park and he brought coffee for the paparazzi," he told the newspaper. "He was just one of us, man." TDK, little Matilda should be a very rich little girl. I am very glad to see that. A Dark Knight fan mashed two of this year's most-copied visuals to create a cool Election Day image. James Lillis subbed an image of Heath Ledger's Joker into artist Shepard Fairey's "Hope" poster for Democrat presidential candidate Barack Obama. Lillis calls the resulting image "The Audacity of Joke." The inspiration was definitely Dark Knight, not the 2008 presidential election, Lillis said in an e-mail interview. "I don't get inspired by elections," he said. "Democracy is overrated." Ledger's performance, on the other hand, spurred Lillis into action. "Heath Ledger's Joker will have to go down as one of the all-time great movie villains," said Lillis, a 32-year-old professional speaker from Brisbane, Australia. " Having watched his scenes over a few times, you'll find there's a lot more to the character than you first assume. His logic is actually quite consistent! "At the risk of getting too philosophical, he comes across as some demonic spawn of Nietzsche and post-modernism. Which is why everyone has such a hard time understanding him -- he rejects popular ideals of rationalism and modernism." So, who does Lillis think the grease-painted anarchist would support in this year's presidential election? However, having said that, the Joker does love to play with politicians with strong moral foundations -- so I really can't see him showing much interest in U.S. politics."